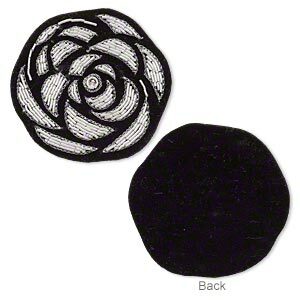 Sew-on component, velveteen and silver-finished copper French wire, black, 1-1/2 x 1-1/2 inch flower. Sold per pkg of 2. Item Number: H20-A3032FN Have a question about this item? These easy-to-use sew-on components are created with a modern version of Zari (or Jari) work--an art form from India which uses metal-wrapped thread woven into fabric. 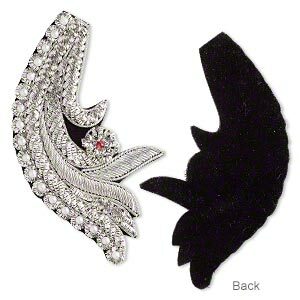 This modern interpretation of Zari work showcases multiple types of silver-finished bullion (French wire) hand-stitched onto black velveteen in complex patterns. Flower can be transformed into jewelry, sewn onto clothing and bags, used for headbands and more. Sizes, shapes and colors may vary with handcrafted items. 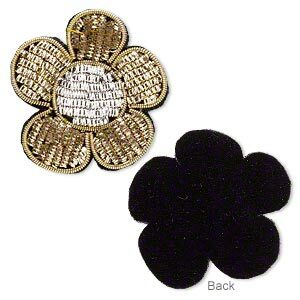 Sew-on component, velveteen and gold- and silver-finished copper French wire, black, 1-1/2 x 1-1/2 inch flower. Sold per pkg of 2. 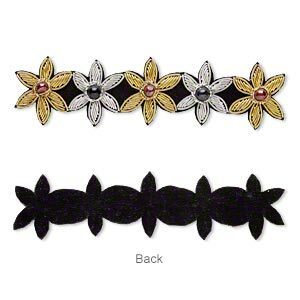 Sew-on component, velveteen / glass / gold- and silver-finished copper French wire, black and red, 5-1/2 x 1-1/2 inch 5 flowers. Sold individually. 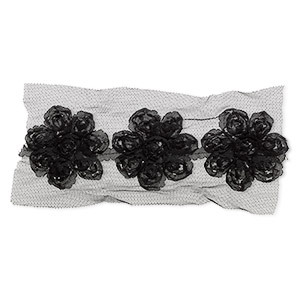 Sew-on component, velveteen / glass / silver-finished copper French wire, black, 2-1/4 x 2-1/4 inch flower. Sold individually. 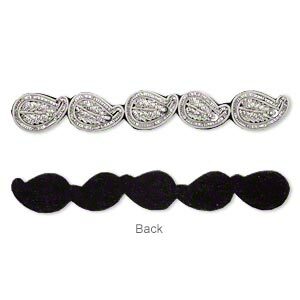 Sew-on component, velveteen / acrylic pearl / glass seed bead / silver-finished copper French wire, black / white / pink, 4-1/4 x 2-1/4 inch fancy. Sold individually. 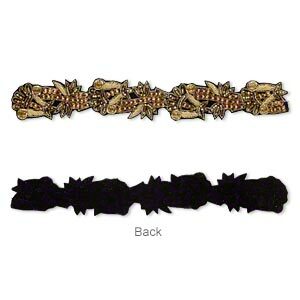 Sew-on component, velveteen and silver-finished copper French wire, black, 5-1/2 x 3/4 inch with leaf design. Sold individually. 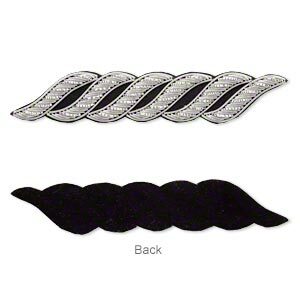 Sew-on component, velveteen and silver-finished copper French wire, black, 6 x 1 inch S-shape. Sold individually. 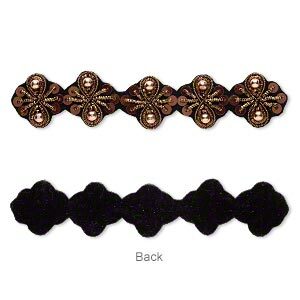 Sew-on component, velveteen / acrylic / acrylic pearl / copper-finished copper French wire, black / brown / metallic brown, 5-1/4 x 1 inch with fancy design. Sold individually. Sew-on component, velveteen / glass / gold-finished copper French wire, multicolored, 8 x 1 inch with fancy design. Sold individually. 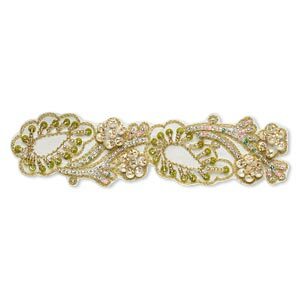 Sew-on component, velveteen / acrylic pearl / sequin / glass / gold-finished copper French wire, multicolored, 5-1/2 x 1-1/2 inches with leaf and flower design. Sold individually. 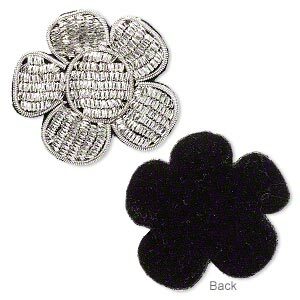 Sew-on component, fabric, black, 2-1/2 to 2-3/4 inch flower. Sold per pkg of 3.